This chapter analyzes the philosophical implications related to the “position of vulnerability” defined by the Directive 2011/36/EU on Preventing and Combating Trafficking in Human Beings and Protecting its Victims as “a situation in which the person concerned has no real or acceptable alternative but to submit to the abuse involved” (art. 2.2). 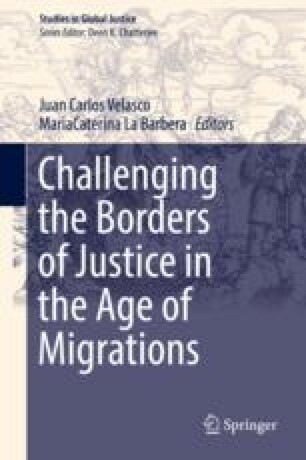 In particular, the chapter focuses on the “choice” made by migrant women employed in care and domestic work and in the agricultural sector in Italy. The Italian labor market is marked by the exploitation of migrant women, especially women from Romania, due to social, economic and legal factors that will be considered from a gender perspective. Women’s rights violations often have significant consequences for the effective protection of children’s rights. The “choice” of these women with respect to their decision to emigrate and their “consent” to exploitative working and living conditions are explored by drawing on interviews collected in Sicily and Venice between 2014 and 2016. Different paradigms of “choice” and “adaptive preference” are analyzed to identify a theoretical model that can grasp these migrant women’s experience. On the basis of the analysis, the last section focuses on the actors responsible for the violation of the rights of migrant women and their children within the Italian labor market. Associatia Alternative Sociale. 2006. Home Alone! Study Made in Iasi Area on Children Separated from One or Both Parents as Result of Parents Leaving to Work abroad. http://www.childrenleftbehind.eu/wp-content/uploads/2011/05/2006_AAS_CLB_Romania.pdf. Last accessed 3 Mar 2017. Associazione Albero della Vita. 2010. Left Behind. Orfani bianchi rumeni. http://www.alberodellavita.org/dossier-orfani-bianchi-children-left-behind/. Last accessed 20 Feb 2017. Fondazione Leone Moressa. 2011. Quali badanti per quali famiglie, Studi e Ricerche sull’economia dell’immigrazione, Venezia, http://www.fondazioneleonemoressa.org/newsite/wp-content/uploads/2012/06/Quali-badanti-per-quali-famiglie_completo.pdf. Last accessed 25 Jan 2017. Idos. 2016. Dossier statistico immigrazione. http://www.dossierimmigrazione.it/. Last accessed 30 Jan 2017. ILO. 1999. Decent Work. Report of the Director-General to the 87th Session of the International Labour Conference, http://www.ilo.org/public/english/standards/relm/ilc/ilc87/rep-i.htm. Last accessed 21 Jan 2017. Kirchgaessner S. 2017. Two Malian Refugees Die in Fire at Farm Workers’ Camp in Italy. https://www.theguardian.com/world/2017/mar/03/mamadou-konate-nouhou-doumbia-malian-refugees-fire-gran-ghetto-puglia-italy. Last accessed 3 Mar 2017. Palumbo, L. 2014. Labour exploitation and trafficking in the agricultural sector. Reflections on the (in)efficacy of anti-trafficking. Interventions in Italy. The Cardozo Electronic Law Bulletin. https://docs.google.com/viewer?a=v&pid=sites&srcid=ZGVmYXVsdGRvbWFpbnxjYXJkb3pvZWxlY3Ryb25pY2xhd2J1bGxldGlufGd4OjVlMjcyNGEwNzExZTQwZWM. Last accessed 4 Mar 2017. Palumbo, L. and, A. Sciurba 2015. Vulnerability to Forced Labour and Trafficking. The Case of Romanian Women in the Agricultural Sector in Sicily. In Antitrafficking Revue, 5. http://www.antitraffickingreview.org/index.php/atrjournal/article/view/136/140. Last accessed 25 Feb 2017. Saviano, R. 2010. Italy’s African Heroes. http://www.nytimes.com/2010/01/25/opinion/25saviano.html. Last accessed 27 Feb 2017. ———. 2013. Effetto serra. le donne rumene nelle campagne del ragusano. L’altro diritto. centro di documentazione su carcere, devianza e marginalità. http://www.altrodiritto.unifi.it/ricerche/tratta/ragusa.htm. Last accessed 4 Mar 2017. Vargas-Silva, C. 2012. EU Migrants in Other EU Countries: An Analysis of Bilateral Migrant Stocks. The Migration Observatory at the University of Oxford. http://www.migrationobservatory.ox.ac.uk/sites/files/migobs/EU%20migrant%20stocks.pdf. Last accessed 20 Jan 2017.